MANILA, Philippines — The 10-member Association of Southeast Asian Nations and the European Union on Wednesday held their second policy dialogue, where both agreed to promote and protect human rights amid issues hounding Southeast Asia. According to a press statement released by the EU delegation in the Philippines on Thursday, among the topics discussed during the ASEAN-EU dialogue were trafficking in persons, achieving gender equality, sustainable use of terrestrial ecosystems, and rights of the child. The two blocs also tackled during their “open and constructive” meeting rights of migrant workers, business and human rights/corporate social responsibility, and rights of persons with disabilities. “The two sides expressed their commitment to the promotion and protection of human rights and fundamental freedoms contained in the Universal Declaration of Human Rights and the international human rights instruments to which ASEAN Member States are parties,” the EU said. “They exchanged views about recent developments in human rights in ASEAN and in the EU,” it added. 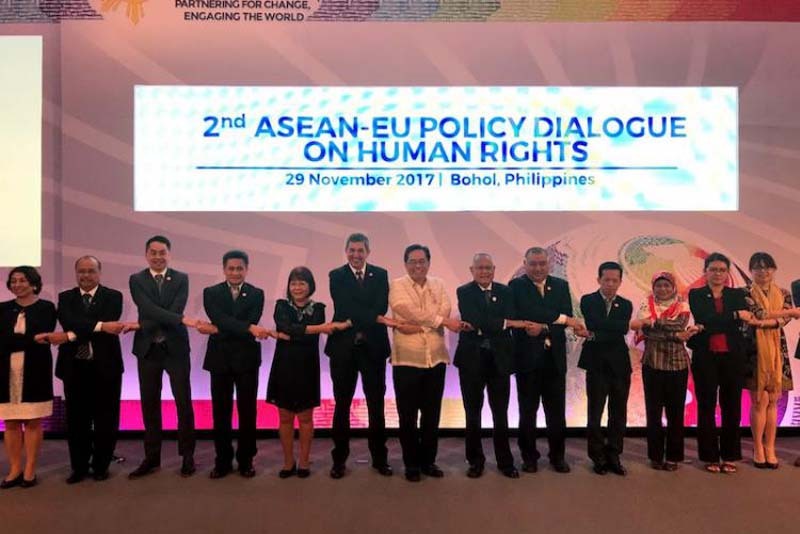 The second ASEAN-EU dialogue on human rights was co-chaired by Leo Herrera-Lim, chair of ASEAN Intergovernmental Commission on Human Rights, and by EU special representative for human rights Stavros Lambrinidis. Both sides convened in Bohol this week. The first EU-ASEAN dialogue was held in October 2015 in Brussels. European Council President Donald Tusk last month visited Manila for the 40th ASEAN-EU Commemorative Summit where he stressed that deepening ties based on respect for human rights and the rule of law remains a “priority” of Europe. In October, a working group representing the ASEAN and the EU met to revive plans to forge a free trade agreement between the two economic blocs. The first EU-ASEAN trade talks were stopped in 2009 after both sides encountered problems in establishing common standards and resolving wealth disparities. Questions over rights record of many ASEAN economies had also become a challenge in creating an FTA given EU’s high regard for human rights in its trade policies.